Here you select which group id(s), or, even more selective, which radio unit(s) within the group will be tracked at a 'Go To Traffic Channel' (GTC). Default, all fields are blank, so in that case every GTC will result in tuning the scanner to the traffic channel. If only a prefix is entered, and the other fields left blank, all radio units within that prefix will be tracked. 021 is the group id (aka prefix). 1420 (originator) and 1462 (target) are the radio units. At a GTC, the radio units will switch to the assigned traffic channel. 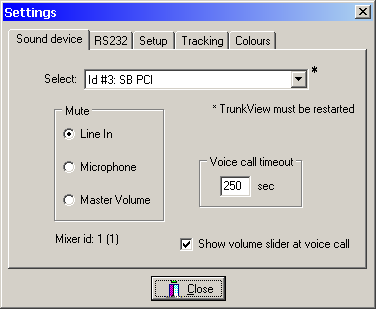 If the scanner also tunes to the traffic channel, this can be notified by a beep from the PC speaker, and/or a balloon popup from the system tray icon. The balloon only shows when using Windows XP or later. Windows 98 users will see a (little) popup near the tray icon. Optionally, voice conversations can be recorded to a WAV file for later playback. So the above mentioned GTC would be saved as: 5229_021_060219_193712_1420_1462.wav if this was a conversation at 19:37 of the company with prefix 21 on the 19th of February, 2006. When the minimize button is clicked, TrunkView will minimize to the system tray. You can choose to have the Close button ([X]) behave likewise, to prevent accidentally closing the program. By ticking this option, an incomimg ASCII formatted Short Data Message will not only be written to the logfile, but will also be shown in a popup from the tray icon. Handy if you run TrunkView minimized: you will be notified of an incoming (ASCII) SDM. Only tick this option, if monitoring a network that doesn't use the standard control channel codeword synchronisation sequence. The defaults will do for most people. The step size is needed when the radio is tuned to a frequency via RS232. The default value is 12.5 kHz and will do in most situations. <setting> can have the following values: 625, 1000, 1250, 2000, 5000 (equals 6.25, 10.0, 12.5, 20.0 and 50.0 kHz). If you have a problem muting the selected sound card you may have to specify the mixer to mute.